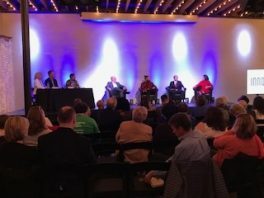 The conversation was all about further advancing Knoxville’s growing entrepreneurial and innovation ecosystem when four of the six announced candidates for the city’s next Mayor participated in the first-ever “Innov865 Alliance Mayoral Forum” Tuesday night at Relix Theater in North Knoxville. The event drew about 130 attendees, at least two-thirds of them new participants in events sponsored by the Alliance of partner organizations focused on helping start-ups advance in the community. And, based on the questions and answers over more than an hour, there was more agreement than there was disagreement about the opportunities for Knoxville, including areas to emphasize, as well as the challenges facing the next Mayor. Participants, in alphabetical order, were Fletcher Burkhardt, Indya Kincannon, Eddie Mannis, and Marshall Stair. John Bevil had declined to participate, and Mike Chase pulled-out on Monday due to a conflict. WATE-TV Anchor Kristin Farley served as moderator and joined with local Entrepreneurs Brandon Bruce and Tanika Harper in asking questions. It was a rapid-fire discussion with the Mayoral candidates offering succinct answers to more than a dozen questions posed during the event. If you were not able to attend, you can view the forum on this webcast link courtesy of WATE-TV. For the Innov865 Alliance, of which PYA, the power behind teknovation.biz, and yours truly are founding members, it was an important event . . . the first forum for the Mayoral candidates and, more important, the first time that entrepreneurship and innovation were front and center in a discussion in this or any other election for the next person to lead Tennessee’s third largest city. With so many attendees who are not regular participants in Innov865 Alliance events, it was also a new audience hearing the message of how important support for start-ups is to the future of the community. The four candidates agreed on many areas . . . the importance of entrepreneurship and innovation, the need to do more in terms of broadband deployment and the growth of higher wage jobs, the need to build on the city’s recognition as a maker community, and the requirement that we do more to address challenges like homelessness and affordable housing. All agreed that the quality of life in Knoxville is outstanding and a real asset in attracting young, talented people. Each also had areas that he or she wanted to emphasize when elected Mayor. In Burkhardt’s case, he continually discussed the importance of bringing more people to Knoxville for concerts and weekend-long music festivals. He saw tourism and the dollars it generates as an important way to help further grow the city’s maker community that was recently ranked in the top 25 in the country. Mannis was the first candidate to mention creating an innovation district along the lines of what Chattanooga and a number of other cities across the country have done. He and others discussed doing more to leverage the University of Tennessee (UT), Oak Ridge National Laboratory (ORNL), and TVA, clearly key components in a thriving innovation and entrepreneurial ecosystem. Stair doubled down on expanding the Knoxville Entrepreneur Center (KEC), saying on several occasions that it needed more space and other resources. In one way or another, Kincannon, Stair and Mannis seemed to endorse a widely rumored idea that including space for UT, ORNL, KEC and Knox County Schools in the available TVA East Tower would be an important initiative for the community. Kincannon discussed micro-loans and zero interest loans as tools to help address the access to capital needs of start-ups. Both she and Mannis also cited specific positions they would create if elected Mayor. Kincannon said she would appoint a coordinator to oversee workforce development, while Mannis said he would appoint a Chief Innovation Officer for the city. Stair emphasized launching an International Business Council, something that other larger cities have. In addition to PYA, other founding members of the Innov865 Alliance are the UT Research Foundation, ORNL, UT Knoxville’s Anderson Center for Entrepreneurship and Innovation, Three Roots Capital, Launch Tennessee, KEC, and TVA.